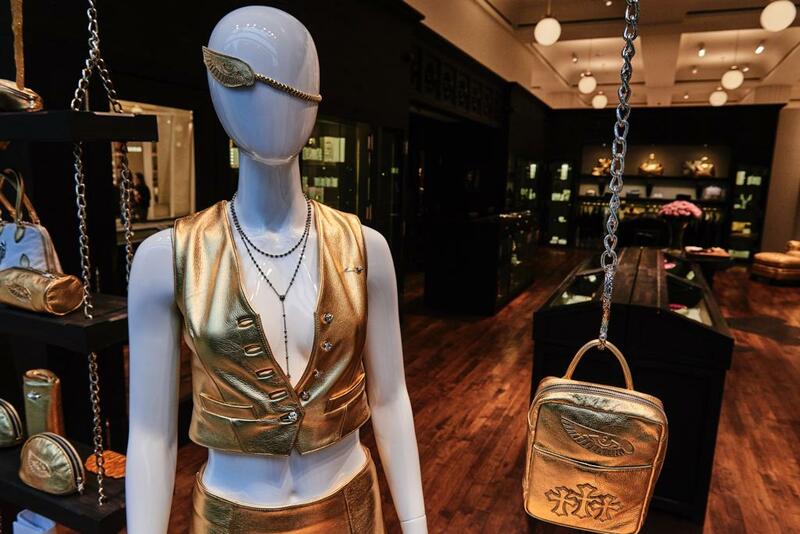 Chrome Hearts pay homage to Pat McGrath with a brand new collection. This is not a drill. Makeup legend Pat McGrath is bringing her iconic beauty brand to Selfridges, with a three-month “Mothership” takeover in the pop-up corner shop which is set to transport any customer into her bold and beautiful world. Known as the “Technicolour Odyssey” campaign, Pat has joined forces with some of the most creative minds on the planet to launch new products, in-store events, and amazing window displays. One of those creative geniuses is none other than acclaimed designer Laurie Lynn Stark and the team at Chrome Hearts. 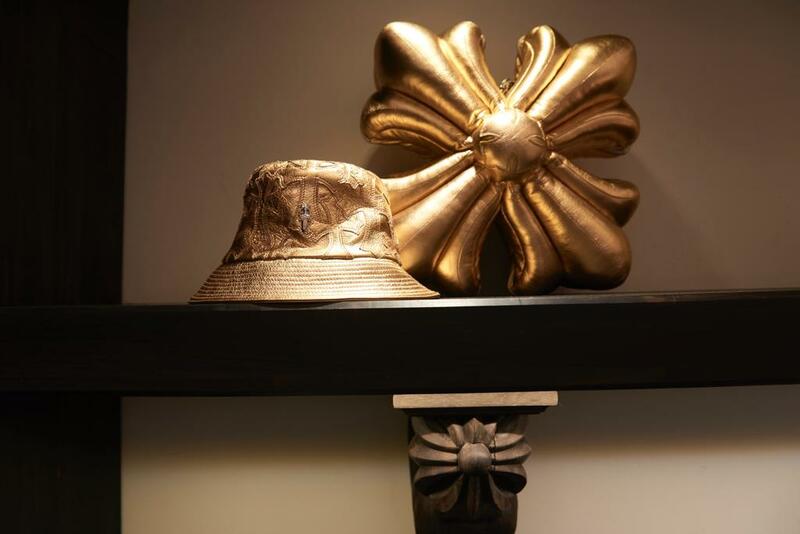 Having been friends with Pat for years, Chrome Hearts have created beautiful pieces in homage to Pat, ranging from makeup bags to eye-catching clothing (hello, bucket hat), all done up in Pat’s fave colour – gold! Hey Laurie Lynn, how are you? Great! So firstly, how did you get involved with the Pat McGrath collaboration? Personally, I know Pat. We’re friends. [Chrome Hearts] have also been in Selfridges for a while and we have a lot of real estate in Selfridges. Rather than being like a whole collab thing, which I think is overplayed in a number of ways, I wanted to honour her and I made these beautiful items for the store and made the entire space kind of an honorary Pat homage in her favourite colour. Amazing. What would you say excited you the most about the project? Well, she’s a genius and she’s a very hardworking woman. The fact that the colour she uses is something that we’re not known for, so that pop of colour in the store and the interesting challenge of how to incorporate something so last minute that we weren’t really planning on doing and being really creative! I love doing creative things and it has to be personal to me or else I don’t really like doing it. Have you always been a big fan of her work as well? Oh, of course! I’m a fan, for sure. She’s a woman and a hardworking entrepreneurial woman, she’s a powerhouse! Her work ethic is very rare and she hasn’t sold out. The fact that she’s done it all on her own, or with the partner she has now who is also a very good friend of mine, it’s tough not to sell out to a big conglomerate and she hasn’t throughout her career. This new collection is called Technicolour Odyssey – how did you interpret that and go about starting the design process? Technically, we did a colour match with leather. I did a very classic, couture skirt and I took her significant eye logo that she has and the detail that she uses and I put it on a very limited production of gold bags orchestrated around makeup. We did a makeup bag, a makeup case, things that hold lipstick, a little mirror, a little thing that holds eye shadow. I had all the artisans come up with a classic twist on some pieces that were made already at Chrome Hearts, but I added Pat’s logo and then mine and sort of meshed them together. 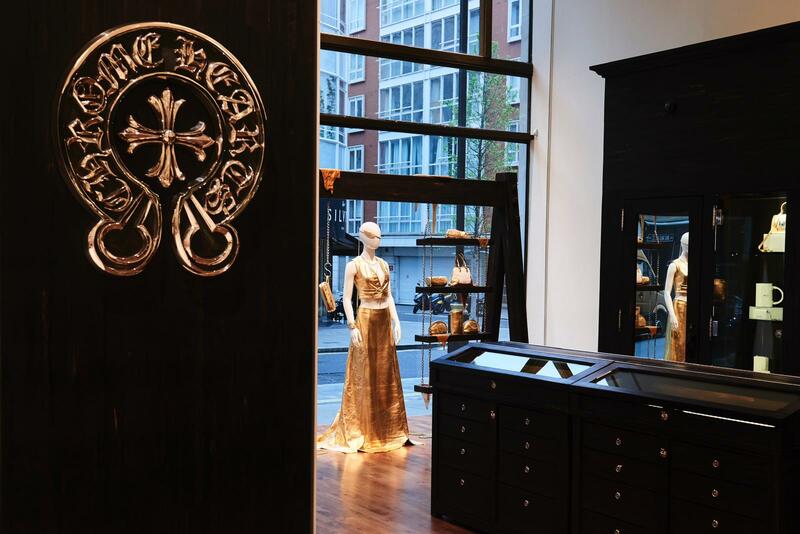 It’s Chrome Hearts history blended into today, and it’s all very limited. There’s the skirt which is one of a kind and it’s a couture piece which you can order. Then there’s the vest, and the rest is makeup related. I took all of Pat’s makeup and fit it into a bag that would fold out. She travels with a huge team and is very organised and archives every colour and she’s extremely technically organised so I wanted to go with that technical side of her organisation skills so that she could actually use the pieces and be glamorous. How was it working with so much gold? We sell a lot of gold! And it’s her favourite colour! Was it challenging blending the rock’n’roll aesthetic of Chrome Hearts with Pat’s style? Well, she’s very dramatic and we’re very dramatic! I don’t find anything creatively difficult that I’m interested in and I don’t do anything that I don’t put 100% creativity in and that I don’t love to do, so it’s usually good. Did you have a specific kind of person in mind when you were designing the collection? I had Pat in mind! What she would physically use as a makeup artist, and what a woman would use for beauty and functionality. Also, someone who travels and is worldly. You mentioned the show stopping gold skirt earlier, what was the vibe that you wanted to go with with that? Really high-end and timeless. That skirt can be worn buttoned down the back, it can be shortened, it can be draping down from a wedding skirt, it can be worn with a t-shirt and tennis shoes. It’s a functioning skirt that has these dramatic buttons. I incorporated a very feminine side with our motif mixed with Pat’s eye logo on the hip. How did you go about deciding what other pieces you wanted to create? The bucket hat is very London, the skirt and vest are high fashion, the gold jeans are for a younger, fresher customer. With the bags there’s everything from a lady bag to a little pouch that they can touch and feel and have a little piece of Chrome Hearts and Pat. We’re already sold out! We haven’t even opened yet and it’s already sold out! I was going to ask what the feedback has been so far, but that speaks volumes! Yeah, before we’d even opened in stores we’re all sold out! Pat loved it and the windows were revealed in the middle of the night and then right away we were all sold out! What would you say is your favourite piece from the collection? Of course the fold out makeup case with the personal items in. I love that she’s filled them with everything you can’t get. You’ve had so much experience in the industry, does doing a kind of collab thing like this still get you excited? Well this wasn’t really a collaboration because I surprised her with the items we made. The collaborative part, I didn’t want to do, we wanted to do an ode to Pat. But of course it’s exciting. It gives you new creative energy which is always nice. Let’s see, what am I allowed to say? We have our first free standing store opening at the end of the year in London which is right in Mayfair. That’s a big deal. I think that’ll be opening around September/October. We’re also doing something with Gareth Pugh in that time. He’s a London darling designer with beautiful work, so we’ve been working on some projects with him which will be very different to what we’ve done. Then we have two events which I’m not allowed to talk about yet!